Founded in 1855, Kean University has become one of largest metropolitan institutions of higher education friendly to Military. UNION, N.J. – Kean University is ranked first in the nation among large public schools for its commitment, effort and success in creating sustainable and meaningful benefits for its student veterans, according to the Military Friendly Schools survey. In awarding Kean the #1 national ranking and gold status, the organization highlighted that Kean far exceeds standards for academic policies, culture, financial aid, military support services and other key areas for student veterans. 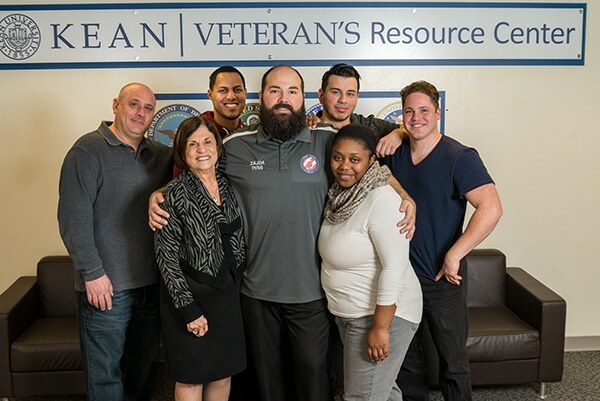 Vito Zajda Veterans Resource Center: Mentors in the Kean University Office of Veteran Student Services, veterans themselves, work one-on-one with student veterans to ease the transition to student life. (Front row, left to right): Patti Martino, executive secretary to Kean’s president; Vito Zajda, director of Veteran Student Services; and mentor Venus Everett. (Back row, left to right): Mentors Daniel Colangelo, Louis Espinal, Matthew Diaz, and Juan Leon-Torres. Vito Zajda, a veteran of the Coast Guard and Kean’s director of Veteran Student Services, says Kean offers one-on-one support to its 251 students who served in the military. Daniel Darasz of Jersey City, a criminal justice student who served four years on active duty with the U.S. Marine Corps and now is in the Marine Corps Reserve, says he benefited from Kean’s personal approach. “Vito Zajda actually kept in day-to-day email contact with me last winter when I was deployed in Asia to ensure my enrollment process at Kean was painless,” he said. Kean provides a broad range of services to its student veterans, including a Transition to Kean course exclusively for veterans. It had a big impact on Almee Jane Gamboa from Secaucus, a physical education student who was in the Marines and served in Afghanistan in 2013. Kean also has the Veterans Integration To Academic Leadership (VITAL) program, which gives on-campus, personal support in accessing Veterans Affairs services; and the Veteran Services Lounge in the Center for Academic Success, where former military men and women can socialize and study. Another program, operated in partnership with Kean’s industrial design faculty, gives veterans a creative outlet to support their emotional needs. They design and create objects using Kean’s 3-D printer. Student veterans have used their time in the digital fabrication lab to create inserts to make prosthetic limbs easier to adjust and that help Kevlar helmets fit better. Another veteran created an X-Box game piece. New programs this year include the Remind service, which gives Kean’s student veterans 24/7 access, via texting, to a support team in any crisis. Also, Zajda has applied to be a Veteran Service Officer, the third in Union County, to support veterans on campus and in the community with medical, military-related and other Department of Veterans Affairs issues. Juan M. Leon-Torres of East Brunswick was in the U.S. Navy for five years and is now pursuing a bachelor’s degree in exercise science. In its 17th year, the Military Friendly® Schools list is released by Victory Media, a service-disabled, veteran-owned small business that connects the military community to civilian employment, educational and entrepreneurial opportunities. Institutions earning the Military Friendly® School designation were evaluated using both public data sources and responses from a proprietary survey completed by the school. Student survey data was also taken into consideration for the designation. More than 1,400 schools participated in the 2018-2019 survey, with 941 schools earning the designation. 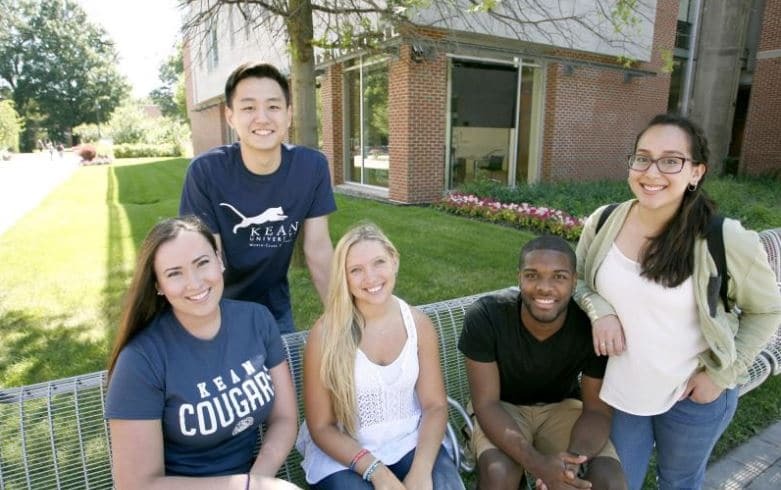 Founded in 1855, Kean University has become one of the largest metropolitan institutions of higher education in the region, with a richly diverse student, faculty and staff population. Kean continues to play a key role in the training of teachers and is a hub of educational, technological and cultural enrichment serving more than 16,000 students. The University’s five undergraduate colleges offer more than 50 undergraduate degrees over a full range of academic subjects. The Nathan Weiss Graduate College offers five doctoral degree programs and more than 60 options for graduate study leading to master’s degrees, professional diplomas or certifications. With campuses in Union and Toms River, New Jersey, and Wenzhou, China, Kean University furthers its mission by providing an affordable and accessible world-class education. Visit www.kean.edu. Previous articleGovernment Solutions Provider Is Hiring Veterans Today!